To embrace the new market trend, we offer you the latest and most advanced POS solution to meet your retail businesses of any sizes. Smart Pos by PayDollar offers complete retail payment solutions one-stop. It provides packaged multiple payment methods that offers total payment flexibility and enables merchants to accept payments on-the-go subject to various devices. Support a wide range of advanced payment options, as well as inbuilt NFC contactless, electronic signature capture. The device comes with the mPOS Plus mobile application that allows merchants to process payments in real-time, view transaction history and sales reports. View sales report and transaction history in real time. Minimize sales that are lost because of long queues and enable real-time acceptance of payment transactions across many options. Both PCI and EMV approved Smart POS device. 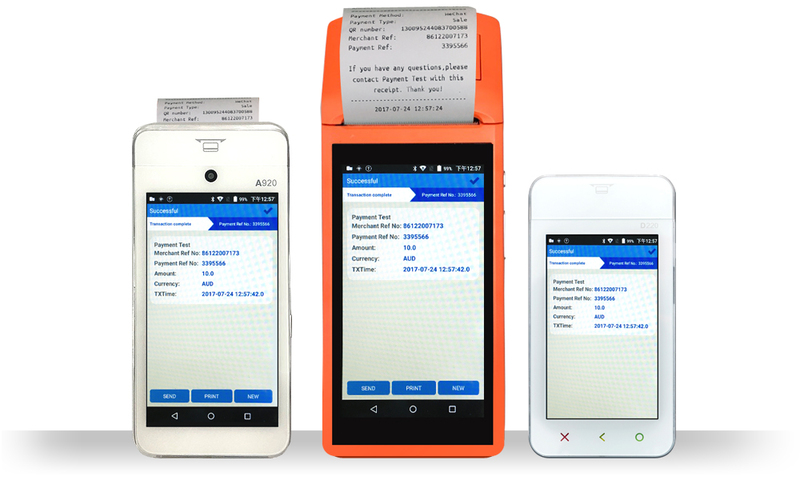 Card Data is read by Smart POS securely before transmitted to the mobile app and the data are transmitted in encrypted format from the mPOS Plus app to payment server. Offers advanced payment options in one device. Multi-payment methods including Online, Offline, QR and Card. Merchants can start accepting payments immediately. It only takes a couple of minutes to configure the application and to set the device.